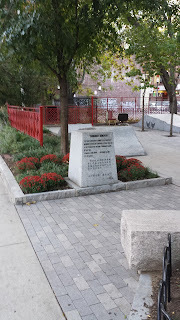 This park is dedicated in honor of the democracy movement in China and in memory of those who died in the struggle for freedom in Tiananmen Square in June 1989. The above photos were taken on October 14, 2015. The tablet was erected on September 10, 1989, three months after the massacre. 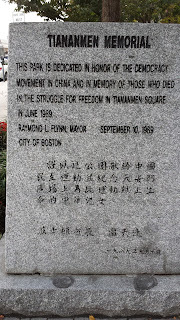 In March, 2010, Boston Globe reported that there was a community dispute on whether to keep this memorial. A compromise was reached to move the tablet into the current, less prominent location.